United Nations (UN) officials are keen to galvanize support for Guyana and other countries in the region grappling with the influx of Venezuelans who are fleeing economic and political turmoil. 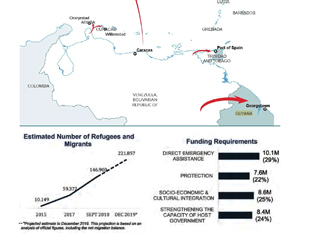 UNHCR, the UN Refugee Agency estimates that a Caribbean response in 2019 will cost at minimum US $34M based on the projection that the refugee and migrant population from Venezuela will grow to around 222,000 by the end of 2019 with irregular arrivals expected to continue. Among this population, around 177,500 refugees and migrants from Venezuela are estimated to require assistance throughout the upcoming year. It is estimated that US $10.1, the largest chunk of the overall financial needs, is required for direct emergency assistance. “A scale-up of the direct emergency and protection response, as well as increased support for socio-economic and cultural inclusion mechanisms, is urgently required to complement governments’ efforts and to ensure communities continue to receive refugees and migrants from Venezuela,” the UN cautioned. In collaboration with regional officials, the UNHCR has prepared a 2019 regional refugee and migrant response plan for refugees and migrants from Venezuela. The plan seeks to tap large donors for financial support. According to the plans, support will be given to the governments of the region in establishing shelters for victims of human trafficking and gender-based violence (GBV) survivors. “These shelters support victims and survivors by offering them a safe space to live where they receive continuous psychosocial and material support vital to their healing process,” the report states. The report calls for regular thematic coordination meetings to be hosted with partners in the Dominican Republic, Guyana, and Trinidad and Tobago to support the authorities’ efforts to respond to the situation and with the objective of avoiding gaps and duplications, addressing obstacles, and ensuring protection as well as predictable assistance delivery to those in need. Regionally, the report noted that in recent years Aruba, Curaçao, the Dominican Republic, Guyana, and Trinidad and Tobago have been hosting growing numbers of refugees and migrants from Venezuela. It is estimated that around 147,000 individuals will have arrived by air, land, and sea by the end of 2018, including some returnees in Guyana. The agency notes that there is a need in some states to develop or improve standard operating procedures (SOPs) for registration, identification, documentation and referral of victims of human trafficking. Access to sufficient food and nutrition, safe drinking water and sanitation facilities, and safe shelter are reported to be the most pressing needs by refugees and migrants from Venezuela in the sub-region. Considering the small size and limited absorption capacity of the concerned countries, the increasing number of refugees and migrants from Venezuela has had an impact on their host communities. According to the U.N, concerns about the growing numbers have led countries in the Caribbean to introduce restrictions on regular migration such as reinstating visa requirements for Venezuelans and issuing visas with more limited time periods. Shrinking regular routes out of Venezuela to the Caribbean has made refugees and migrants, especially women and children, particularly vulnerable to human trafficking and smuggling, as well as to increasing risks of exploitation and abuse. Who would have thought that the people of an oil-rich nation could one day become refugees? Tomorrow, cast to the winds. “IT’S NOT A GIFT!” I yelled at the unresponsive car radio (at least three times), while listening to a chavista talk about the awesome “revolutionary gift” the Maduro government would hand through CLAP this December: “pernil” — the traditional Venezuelan Christmas leg of pork. Do you consider that the resources administered by the head of the homeowners’ association or your condo board belong to him? Do you thank him every time he approves a maintenance expense? If he buys ornaments for the Christmas tree in the entrance do you consider it a gift? I dare say NO. The same applies for the government: Governments do not own public resources; governments are mere administrators of those resources. However, the Venezuelan governments of the 20th century have been traditionally paternalistic, a phenomenon that sat on the massive amount of resources generated due to the black gold: OIL. And if you take this and add two cups of 21st century socialism, you end up with the most inefficient government Venezuela has ever seen. And this isn’t a Venezuelan novelty. This is actually related to the so-called “soft budget constraint”, originally formulated by Janos Kornai to illuminate economic behavior in socialist economies marked by shortages, and regularly invoked in the literature on economic transition from socialism to capitalism. “The soft budget constraint phenomenon is a joint outcome of two closely related socio-political trends. First, the increasing, and often overloading demand of society on the State to become a ‘protector’, responsible for the welfare, growth and the national economic interest; and second, the self-reinforcing tendency of bureaucratization. What has this done in our case? Chavismo has done everything to make Venezuelans economically dependent on the State, forcing them to remain loyal. Hence: it’s not quite right to say chavismo wants people to be poor; it wants them to depend on the State. And right now, given the current hyperinflation and shortages, the Christmas celebrations depend on the State. So the whole #FelizChavidad isn’t mere propaganda. Interesting enough, social dependency on the State is turning against the resourceless Maduro government and chavismo has been having a hard time defending itself. “There are people who have never eaten pernil and now they protest because it hasn’t arrived”. So this Christmas, every time you hear someone talking about the awesome “revolutionary gift” the Maduro government gave them, remind them that it’s because of the economic chaos that 21st century socialism has generated that families can’t buy their own pernil.